The Walsh administration has poured more money into school budgets, and student performance has improved in some areas. First in a series of articles examining the record of Boston’s mayor and his leading election challenger. Brighton High School began the academic year with its varnished floors gleaming, a new headmaster brimming with optimism, and students — some from conflict-ridden countries — anticipating a better tomorrow. A year ago, hope of any kind was in short supply. Brighton High was one of two city high schools the state deemed underperforming — and facing the prospect of state receivership in three years unless things turned around. 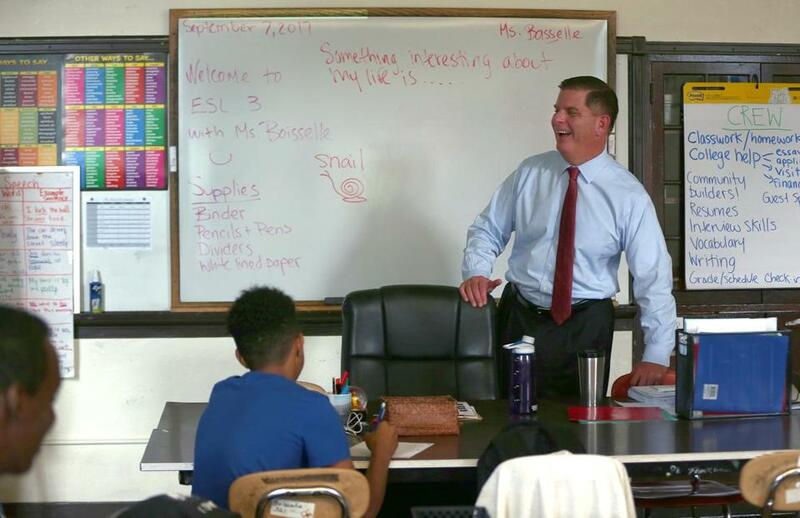 On a visit last Thursday, Mayor Martin J. Walsh asked the headmaster about the teachers he had met last year who had been worried that the state would step in, worried about their students — many of whom come to school each day with clear disadvantages but a deep desire to learn — and worried, of course, about their jobs. Many of those teachers are no longer here; roughly half of the school’s 60 teachers are new. And as headmaster Robert Rametti outlined for the mayor, there is now in place an aggressive plan for a state-mandated turnaround, including a longer school day, four full-time psychologists to tackle students’ problems, and new instructional techniques. Lifting the performance of the students comes next, and no one is saying it will be quick or easy. English is not the first language for 42 percent of the 750 students, and 61 percent come from economically disadvantaged homes, state data show. As Walsh seeks reelection this year, the state of Brighton High offers a glimpse into the numerous challenges a big city mayor faces in tackling some of the school district’s myriad woes. When he ran four years ago, he promised to make every school a quality school. His rhetoric as a candidate was sweeping and ambitious, but he knew then — and knows even better now as mayor — that school change is hard, and progress often gradual. Not tomorrow, perhaps, but soon. The slow pace of progress is a growing issue for parents who say the mayor has moved too gradually and cautiously on his pledge to reshape Boston’s long-struggling school system. The Walsh administration has poured more money into school budgets, and student performance has improved in some areas — including key measures such as high school graduation rates, now at a record. 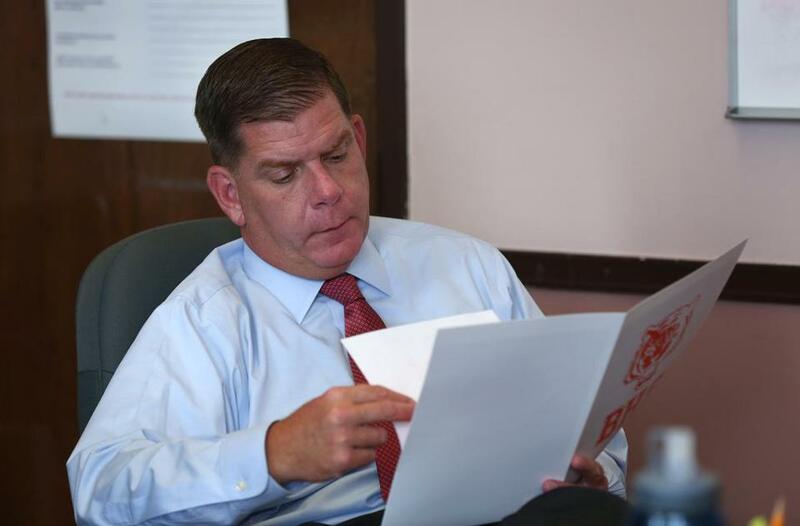 But a Globe review of Walsh’s education policies and plans showed his most ambitious initiatives — such as developing a comprehensive school construction plan and one-stop registration for city and charter schools — have been mired in studies and public debate. And his campaign promise to offer prekindergarten classes to all who apply has run headlong into concerns about costs, though it remains a commitment he vows to keep. Walsh started off strong his first year by striking an agreement with the teachers union to extend the day at dozens of schools. In 2015, a new superintendent was recruited from Los Angeles, with Walsh’s strong support. And in the last few months, Walsh has picked up some momentum, teaming up with Governor Charlie Baker on a program to offer free tuition to Boston students at state colleges and securing a new contract last month with the Boston Teachers Union. But in the months and years in between, his education agenda was slowed by controversies, from heated allegations of racism at Boston Latin School to protests over school budget cuts that roiled parents, students, and teachers. Even the recently concluded teachers union contract hit an impasse in May that required intervention from a state mediator. 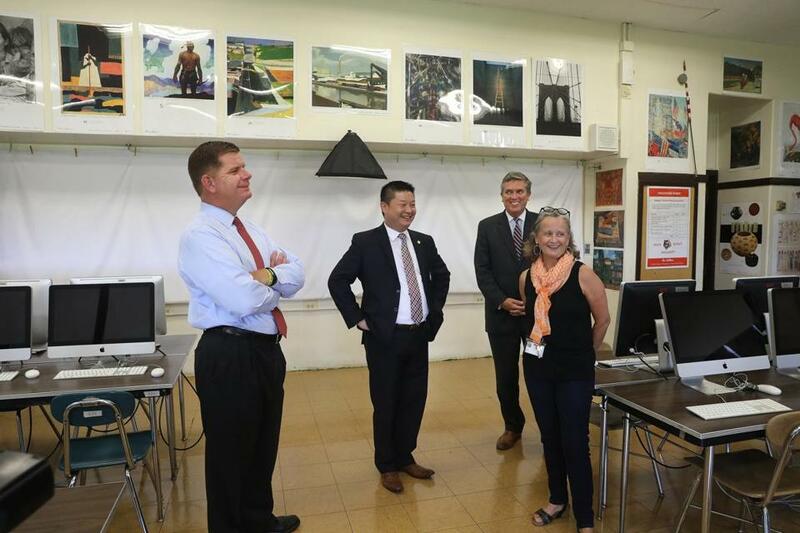 From left: Walsh, Superintendent Tommy Chang, and School Committee Chairman Michael D. O'Neill visited the Brighton High teacher Patricia Kelliher’s graphic arts studio on Thursday. This is not how Walsh’s education agenda was supposed to go. The former state representative won City Hall nearly four years ago in part by convincing voters that he — and not his opponent, then-city councilor John Connolly — was the best person to overhaul the school system. Walsh billed himself as an education reformer, touting legislation on Beacon Hill that expanded charter schools and facilitated the brooming of teachers out of schools with low standardized test scores. He said his experience as a labor leader would allow him to get the teachers union to support his agenda. But since capturing the corner office, Walsh, while a vocal supporter of the school system, appears to have bowed, just as his City Hall predecessors did, to the reality that rapid change is almost impossible in a large public system with a powerful teachers union. He can be defensive at times when called on the gap between his campaign promises and classroom reality by his top challenger in this year’s mayoral race, City Councilor Tito Jackson, who has made education a cornerstone of his campaign. 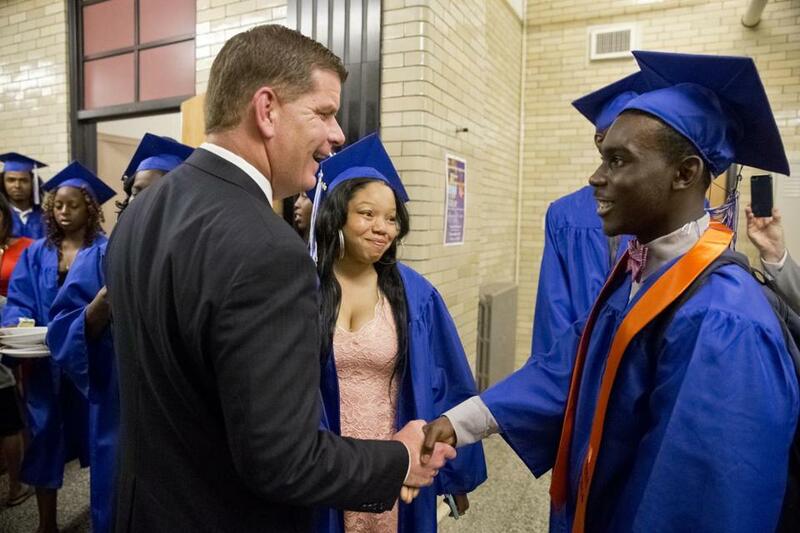 Ticking off his achievements, Walsh said his administration increased the Boston public schools budget by more than $154 million and boosted high school graduation rates to a record 72.4 percent, an increase of more than 6 percentage points since he took office. (This continues the trend under his predecessor, Thomas M. Menino, who saw graduation rates rise nearly 7 percentage points from 2006 to 2013, although it was not a steady increase). More students are in higher-performing schools than before, he added. A Globe review of state data also found that the school system is boosting student achievement at some levels. Tenth-grade MCAS scores nudged up 4 percentage points on the English test, to 83 percent, and 2 percentage points on the math exam, to 66 percent during Walsh’s tenure. The number of higher-performing schools has increased, though some high schools, particularly, continue to lag. But on other measures the district lost ground, especially in closing gaps in achievement among students of different socioeconomic and racial backgrounds, the Globe found. For instance, the gulf in graduation rates between black and white students has widened during Walsh’s tenure by almost 2 percentage points. In 2016, the most current year available, 82.5 percent of white students graduated in four years, compared with 69.3 percent of black students. Also, while the school system has more schools at the highest two levels in the state’s five-step accountability system, the number of schools in the bottom two categories has grown from nine to 12 during Walsh’s term. Education experts say Walsh deserves a grace period before judgment is rendered on his efforts in the schools. Overhauling an urban district is a long and complicated endeavor, and the mayor deserves time to put in place his schools agenda, said Paul Reville, a former state education secretary who is now a professor at the Harvard Graduate School of Education. But Reville also said that by the end of the mayor’s first term, the public deserves a better understanding of what Walsh plans, and when results are expected. “I think we should have greater clarity of what the Walsh administration has accomplished or is seeking to achieve in high school innovation, school closings, charter schools, and the teachers’ contract,” Reville said. Some voters feel let down by the slow pace of progress. In a Suffolk University/Boston Globe poll in June of likely city voters, more than half of the 500 respondents said the schools either have stayed the same, have gotten worse, or have gotten a lot worse since Walsh took office. Menino did not fare much better: In a 2009 Globe poll, the schools were rated as fair, poor, or very poor by 59 percent of the respondents. Like many other parents, Field is concerned that Walsh will call for school closings when he releases his long-term school construction plan, dubbed BuildBPS. E-mails obtained last year through a public records request by a grass-roots parents group revealed that a city consultant suggested shuttering dozens of schools, as declining enrollments have left the system with surplus classroom space. The controversy prompted Walsh to deny any school closure plans. Walsh, in his Globe interview, repeatedly blamed some of the Boston school system’s problems on bad press and public misconception. Walsh greeted Milton Harris before his graduation ceremony at Jeremiah Burke High School in 2016. Walsh has considerable power in influencing education policy. The city is one of the few nationwide where mayors have the authority to appoint the School Committee. That gives Walsh clout in selecting a superintendent and setting education priorities. As he campaigned, Walsh promised a “top-notch district,” where every school would be high-performing. He said success would require “a hard look at the current practice’’ and “political will’’ to reshape the system, which has 10,000 teachers and staff, 125 schools, and the city’s largest and most powerful union. It was on the campaign trail where Walsh first talked of targeting high schools for an overhaul — pitching the idea of ninth- and tenth-grade academies, for example — and of spending $1 billion to renovate or replace school buildings. He also voiced support for more charter schools, putting him at odds with the city’s teachers union. At his inauguration, Walsh held up reforming Boston’s school system as a chief means to eliminate a divide in the city between privilege and poverty, and he specifically called for universal early education, high school overhauls, and dual language programs, high-quality career and technical training programs, and eliminating achievement gaps among students of different backgrounds. “Every kid in Boston deserves a great education that will give them opportunity to get ahead,” Walsh told a cheering audience at Symphony Hall. But as Walsh settled into office, his education agenda proved difficult to execute and the exhaustive planning process he favors proved complex and time-consuming, involving committees, copious research, and multiple rounds of public input. Michael O’Neill, chairman of the School Committee, defended Walsh, saying the mayor wanted immediate improvements in the district but instead chose a deliberative approach. 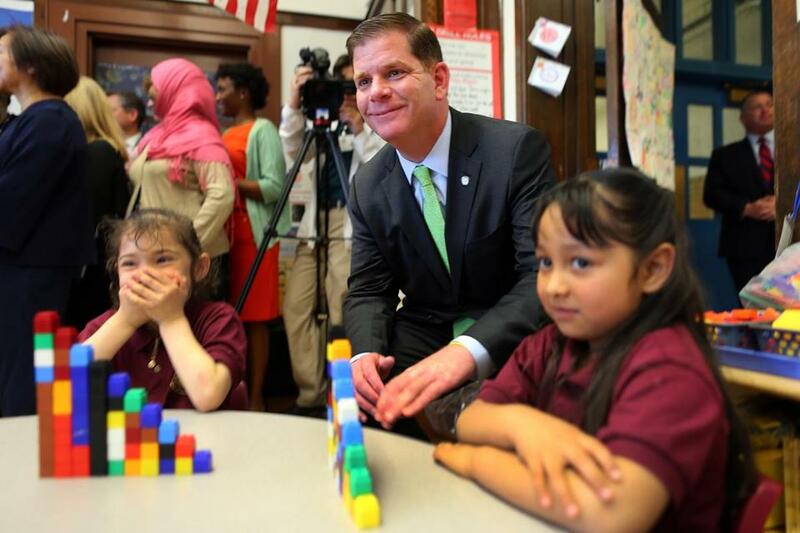 ■ In May 2014, Walsh created an advisory committee to double high-quality preschool enrollment by 2018, but he kept the committee’s plan under wraps for more than a year. Walsh has made some progress, creating 750 seats in full-day programs with certified teachers and well-vetted curriculums. ■ In May 2015, Walsh enthusiastically supported redesigning high school education, but the effort has largely focused on overhauling a handful of underperforming high schools where the state is mandating changes. ■ In September 2015, Walsh formally launched his BuildBPS plan to rebuild many of the city’s decrepit schools. But after 18 months, the city released a report that only detailed the conditions of the school buildings and did not recommend fixes or closures. ■ Also in September 2015, Walsh announced plans to unify the enrollment systems for charter and city-run schools, but he put the effort on ice after a backlash from parents. “If people want to criticize my administration and me for being slow and thinking through some things . . . that’s OK,’’ Walsh said. The mayor said he and Superintendent Tommy Chang now have a solid team in place to take the district to the next level. They are making progress on Chang’s long-term plans for the system. The early challenges are behind them now, said Walsh. “He trusts me in running the school system,” Chang said of the mayor. The range of proposals Walsh pursued, notwithstanding their deliberate pace, has impressed many education advocates around the city. Neil Sullivan, executive director of the Boston Private Industry Council, a nonprofit that works with Walsh on youth workforce development and other education initiatives, said mayors will always face criticism for not moving fast enough on overhauling schools. Walsh visited Brighton High teacher Martha Boisselle’s classroom last week. At Madison Park Technical Vocational High School, long a problem child in the Boston system, the hope that Walsh promised at the start of his administration is fading. Walsh had made the school the focal point of his high school redesign effort, testing out new ideas that could be replicated citywide, such as connecting classroom lessons to internship programs. But a few months into the effort in 2015, the state declared Madison Park underperforming, following years of dismal MCAS scores and graduation rates, declining student enrollment, and a revolving door of administrators and teachers. Enrollment plummeted from 1,146 in 2014 to 841 currently, school data show. The school’s headmaster, Shawn Shackelford, went on leave last December and resigned in June for reasons the district has declined to disclose, creating more instability. Madison wasn’t the only high school reeling last year. A mile away, Boston Latin School was at the center of a federal investigation over allegations that racist comments by some students went unheeded. The controversy led to the resignation of headmaster Lynne Mooney Teta and assistant headmaster Malcolm Flynn, upsetting teachers and parents who felt that Walsh did not stand up for them through the crisis. When Walsh visited the school and urged unity, the teachers walked away in protest. The Latin School fiasco highlighted another troubling issue: the underrepresentation of students and faculty of color at the school. And it forced a districtwide discussion about expanding rigorous classes to more students of color to increase their chances for entry at one of the city’s three exam schools. Prompted by the Latin School furor, school officials moved on another front. They nearly doubled the number of seats to participate in a free test-preparation program, inviting fifth-graders with top standardized test scores from all parts of the city. But black enrollment has not yet improved at Boston Latin. Of the 495 students invited to enter Boston Latin’s seventh grade this fall, 39 — just 8 percent — are black, the same percentage as this year’s student body, the Globe previously reported. Fourteen percent are Hispanic, up slightly from this year’s 12 percent. Across the system, 32 percent of students are black and 42 percent are Latino. Walsh looked through an information packet on Brighton High, as headmaster Robert Rametti gave an overview to visitors. The state declared the school underperforming during Walsh's tenure. With many of Walsh’s proposals coming together gradually, or in limbo, some voters and civic leaders question whether he is holding off on tough decisions or is temporarily distancing himself from some controversial positions until after Election Day in November. For instance, many parents upset that the city appeared to be contemplating school closings were pleased earlier this year when Walsh said the problem with school buildings was neglect rather than excess capacity. But they are waiting to see if the final recommendations for fixing buildings, which are due out sometime after the election, will include any school closures. Walsh denied that political considerations have affected the rollout of his major initiatives, and dismissed criticism that he will not take any bold action until after the election. He noted that he supported Chang’s recommendation to close Mattahunt Elementary School in June, and has taken heat from the Mattapan community for it. “I want to continue to make great gains,” he added, “and down the road people can say, ‘Wow, the Walsh administration and the Chang administration really did’ ” what they set out to do. 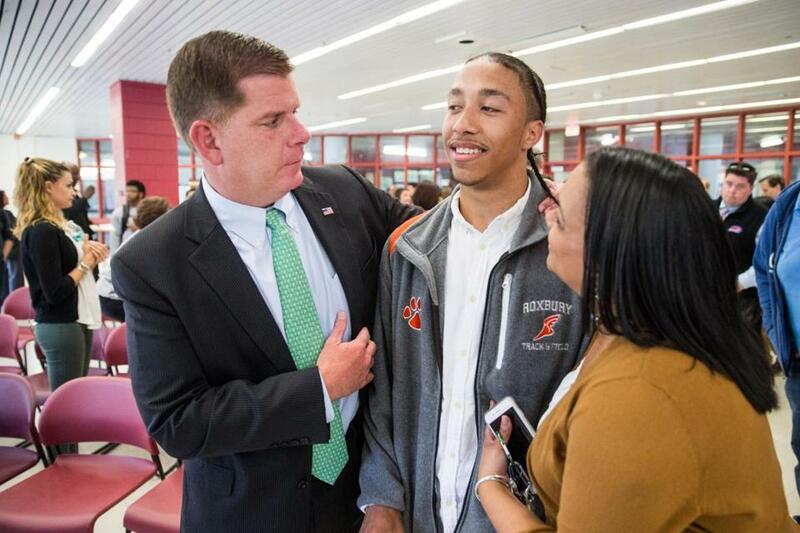 Walsh greeted Eddie Barreto at Madison Park Vocational Technical High School in Roxbury in May. Meghan E. Irons can be reached at meghan.irons@globe.com. Follow her on Twitter @meghanirons. James Vaznis can be reached at james.vaznis@globe.com. Follow him on Twitter @globevaznis.